Faith Murray made a recording for the Talking Information Center Network. Inside the studio nestled in a nondescript industrial park in Marshfield, Liz VandenBergh fiddled with some knobs and when everything was ready to go she turned to the announcer. “Are you ready, Faith?” she asked. Faith Murray is 11 years old. She is in the fifth grade. She is blind. And she has one great set of pipes. For the last few months, she has been recording the weather forecast and public service announcements for the Talking Information Center Network, which reaches tens of thousands of people who are visually impaired or have other disabilities. The network’s staff and an army of volunteers read various newspaper and magazine articles during broadcasts. Faith has a new gig, in which she does a Did You Know segment. This week she focused on the causes of visual impairment and blindness in children. “I know all about it,” she said. They have had interns at TIC before. But no one as young as Faith. And maybe no one as natural. It all happened by chance. Some of Faith’s teachers at the South Shore Educational Collaborative in Hingham came across the TIC table at a conference in Norwood. Shelley Binder, who has been teaching Faith since the girl was 4, and Naomi Zabot, who is Faith’s orientation and mobility specialist, looked at each other and thought of her. “We thought it would be a good exposure for Faith,” Zabot said. But it’s kind of worked the other way around. When TIC had its 40th anniversary dinner at Granite Hills a few weeks ago, the group was hoping to auction off a TIC teddy bear for $40. Jim Fagan, the auctioneer, introduced Faith to the crowd and, after a little back and forth, it fetched $650. As she and VandenBergh recorded the weather forecast, TC, another teddy bear, sat next to Faith. Faith is wary of being typecast as any sort of celebrity, but she acknowledges she enjoys hearing her voice on the radio or streaming from a computer. She has a great memory: She can, for example, recite, verbatim, the rather long announcement that precedes every ride on the Paragon Carousel at Nantasket Beach, the one that insists there will be no switching of horses once the ride begins. And there are other, uncommon talents. When her teachers and aides enter the classroom, Faith knows who they are even before they speak, and greets them by name. Zabot and Binder nod vigorously. Faith likes knowing that many of the people listening to her voice are at veterans hospitals. “They helped me, now I can help them,” she said. 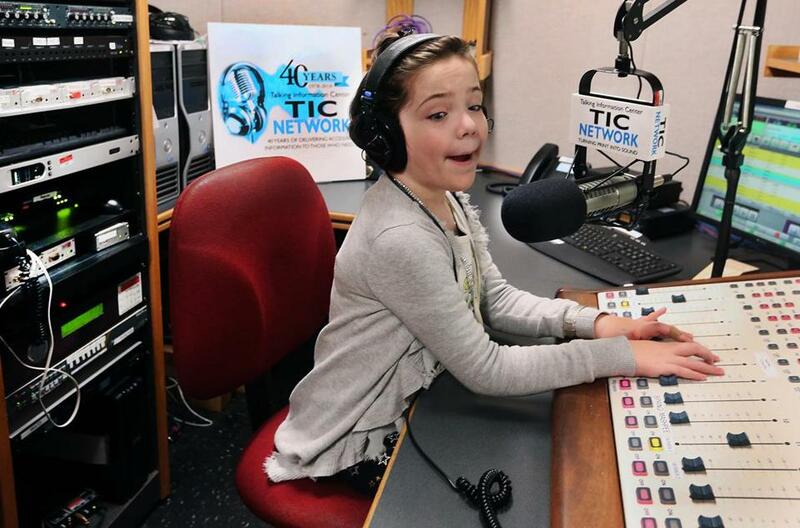 Faith thinks she might like to work in broadcasting when she gets older, or maybe music. She does a mean version of “Let It Go” from “Frozen” during karaoke at school. Sitting in the studio, she wore a shirt covered with words Faith knows but can’t see. Faith Murray’s eyes don’t work. And yet she can see more than most. She sees everything that really matters.